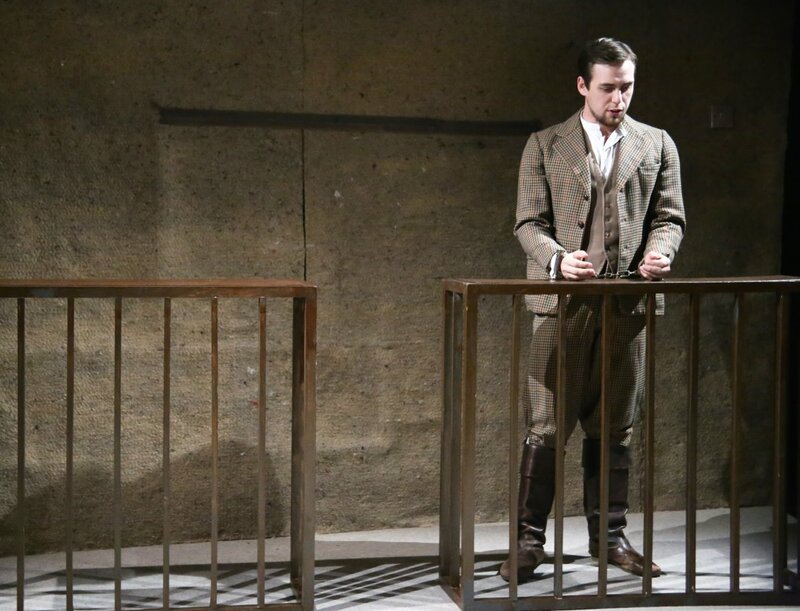 John Osborne's incisive look at freedom and intolerance is given a fresh look in this resourceful production playing for a short run at the Finborough Theatre. Originally written for television in 1960, simple staging and riveting performances will have you transfixed. The story follows George Jacob Holyoake, the last man to stand trial for blasphemy in England. 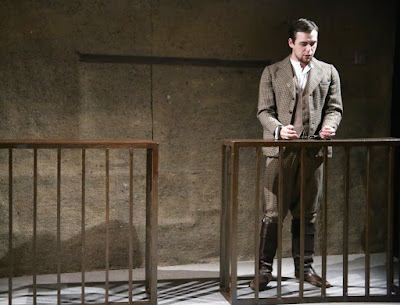 He is played here by Jamie Muscato who gives the role a dark intensity and determination as a man whose world crumbles around him while he holds onto his beliefs. His performance includes a series of monologues. Each one comes with increasing intensity and fervour. First as he attempts to defend his right of opinion and then as he attempts to rebut the charges of blasphemy. The rest of the cast serve the material well. Caroline Moroney plays his wife. She is obedient and subservient to his wishes, even when it is against her better judgement. 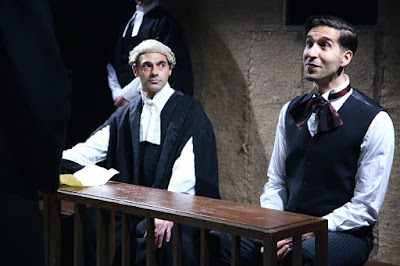 Edmund Digby-Jones plays a variety of unsympathetic roles, including the spiteful prison chaplain, who uses his faith as a weapon against Holyoake. Doron Davidson as the knowing narrator sets the tone of the piece at the opening and closing. The set consists of a series of benches and bars that neatly form the structures within the story. Jail, court room or somewhere between. They are assembled and disassembled with flair by the cast. Freedom of thought and freedom of expression (or the lack of it), are subjects explored in many plays at the moment. David Hare’s piece within The View From Islington North covered it. It charts a hypothetical encounter with the Home Secretary and the high priestess of the free market, Ayn Rand. They debate freedom including the freedom to say and do what you like within the construct of a free market. There is a great line where the Home Secretary exclaims something along the lines of our freedom is derived from being subjects of the crown. I couldn't help but feel we all as subjects have something to consider here too. There is no happy ending, but there is food for thought about what it means to be a subject of the crown. 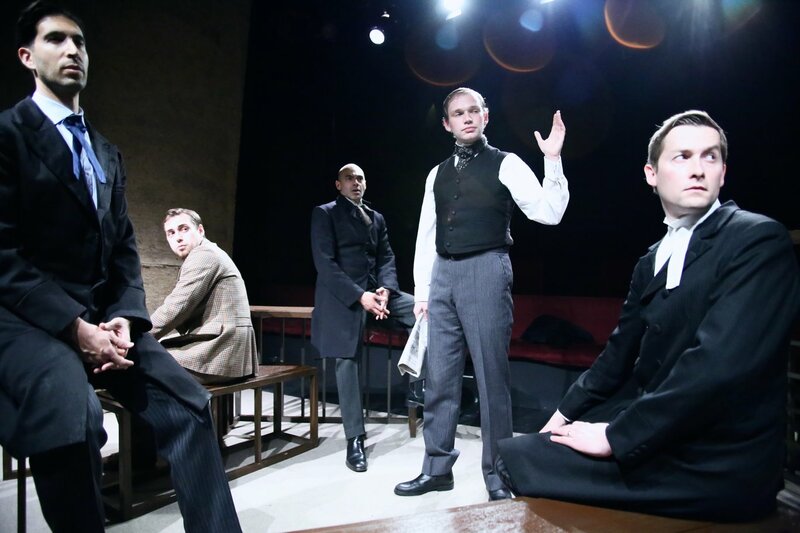 A Subject of Scandal and Concern directed by Jimmy Walters runs at the Finborough Theatre until 7 June. First impressions with @Johnnyfoxlondon below.